The Project has day places available for people on Direct Payments or who wish to privately fund a day place. Our service offers a nutritional hot meal and activities to suit the older people who regularly attend. Transport may also be available dependent on where the person lives. Our Centre also has an Advice Service, Carers Support, a footcare service (Happy Feet) and are unique in providing a service for people with NHS Hearing aids where the batteries can be changed, the hearing aids cleaned and the tubes cleaned and/or replaced. 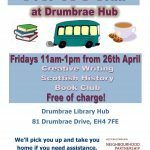 This part of our service is available Monday to Friday from 11am to 2pm as a drop in.